A few weeks ago, I was walking with my husband at the park when an enormous, bearlike dog came out of nowhere and barreled into me. Caught by surprise, I got knocked into the dirt. When the shock wore off, I realized my ankle had twisted in a way it wasn't meant to and I had trouble getting to my feet. Within an hour, my ankle had swollen to double its normal size and I couldn't put weight on it. I was about to head to the emergency room (ER) — and the huge bill that would undoubtedly come with it — when I reviewed my insurance policy to see what my copay would be. In the paperwork, I found out that going to an urgent care facility would be much cheaper. I was thrilled and the urgent care facility I visited helped me get back on my feet (literally). When deciding where to go, consider just how serious your injury or illness ill. 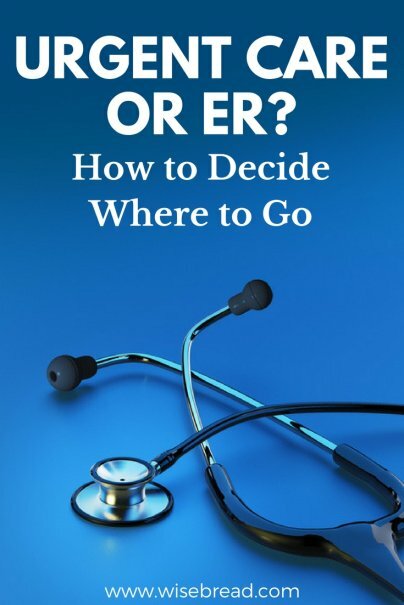 If you're sick or have an infection and your doctor is unavailable, you may think the ER is your best bet. However, some insurance companies don't cover ER visits for non-life-threatening emergencies. That means that if you have something like pink eye and go to the ER, you could end up footing the bill entirely on your own. If you're not facing a true medical emergency, an urgent care facility is a cheaper and safer option. Deep wounds or severe burns. If you are hurt or sick outside of your doctor's normal business hours, both urgent care centers and the ER are useful options. Although urgent care facilities tend to have longer hours than your normal doctor, they are not usually available around the clock. If you are injured late at night or very early in the morning, your only option may be the ER. Most urgent care centers operate on a first-come, first-serve basis. You could wait as little as five minutes to see a doctor or have X-rays done. You'll also get necessary treatments and be on your way home faster than you would seeking treatment at a hospital. Emergency rooms work differently. They use a triage system, where patients are seen based on the seriousness of their condition. If you have a mild problem, such as a sprained ankle or a sore throat, you could wait several hours so that others can be seen first. Many doctors working in emergency rooms are independent contractors. That's important to know, because that means they may not operate within your insurance provider's network. Visiting the ER and being cared for by an out-of-network physician can mean a huge bill later on. If possible, going to an in-network urgent care center will be cheaper than going to the ER. However, if your illness or injury is serious and you need to go to the ER, you can request an in-network doctor when you fill out your admissions forms. Depending on your condition and whether or not you have insurance coverage, you could be on the hook for a large medical bill regardless of what kind of center you visit. If you are short on cash, where you go can affect what payment options are available to you. Most urgent care facilities require payment in full before you leave and don't offer payment plans. If you don't have insurance, you could have to pay hundreds or even thousands right away. Without that money in savings, you might have to rely on credit cards to pay it and end up in debt. If you've already been hit with a big bill after medical treatment, don't panic. There are ways you can negotiate your medical bills and qualify for financial assistance or reduce how much you owe.